Turkish reporter Burak Bekdil, a fellow at the Middle East Forum. Since being taken over by the state Friday, Turkey's top-selling newspaper, Zaman, has dropped its criticism of the government and published flattering stories about Turkish President Recep Tayyip Erdogan. Many Turkish journalists voiced alarm at the turn of events, with one journalist telling Israel Hayom on Sunday that he was not at all surprised by the crackdown. "The Zaman incident did not surprise me at all," said Burak Bekdil, of the Turkish daily Hurriyet. "It proves that the Islamists have no boundaries, even when they are fighting their own allies, in the name of preserving their rule, and Islam as well." 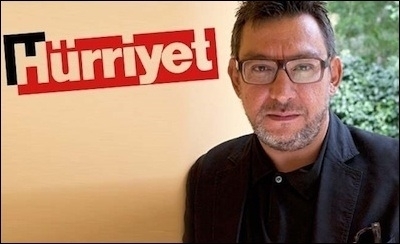 Bekdil is one of the most important journalists in Turkey, and has been described by the J. Paul Getty Trust as "a frequent critic" of Erdogan. In several articles in 2012, Bekdil defended Israel, which is unique for a journalist from an Islamic country. In the past, Bekdil has served prison time for his criticism of the government. Bekdil is convinced that despite pressure from the U.S. and the EU over Erdogan's crackdown on freedom of the press, it is only a matter of time before the Turkish president goes after his next target. According to Bekdil, Erdogan is guiding Turkey toward an extremism reminiscent of other Arab countries. "I don't know who or what media outlet will be next, but I'm sure that another incident will take place," he said. "Islam and pluralism cannot live side by side." "I like writing in a way that Erdogan doesn't like and I have no intention of quitting," says Bekdil. Bekdil also expressed his fear of the regime targeting individual journalists. "I know that Erdogan and his people have the ability to hurt me or other reporters who are not physically in Turkey," he said. "This is not a comfortable way to live. Yes, I am afraid. But I like writing in a way that Erdogan doesn't like and I have no intention of quitting." The episode at the Zaman offices was the latest twist in a long-running conflict between Erdogan and U.S.-based Islamic preacher Fethullah Gulen. Police raided the offices of Zaman, which is affiliated with Gulen, late on Friday after a court approved a request by a prosecutor to appoint a state administrator to the daily. The prosecutor is investigating whether funds have been diverted to Gulen.